BOBBINS, a free children's book by Emma Laybourn. 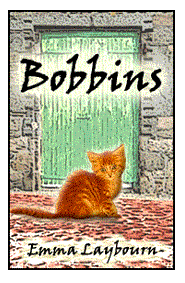 Can Bobbins prove himself as brave as the other mill cats? The huge rat crouched with its back to the wall. Its red eyes glittered balefully as it bared its vicious teeth at Bobbins. It was nearly the same size as the little ginger cat. Bobbins had cornered it quite by accident. And now he had no idea what to do. "Just my luck!" he thought. "I come down to the yard for a bit of peace and quiet, and surprise the biggest rat in the whole mill!" If he didn't kill the rat, the other cats would never stop laughing at him. But he'd never tackled anything as big and fierce as this. Bobbins took two slow, cautious steps towards the rat. All his ginger fur stood on end. He saw the rat bunch its muscles, getting ready to leap. "I've got to leap first!" thought Bobbins. "But it's nearly as big as I am. Help!" He closed his eyes and pounced. The huge rat's fur slipped through his claws: its sharp teeth met in his ear. Bobbins squealed, trying to twist away. Letting go of him, the rat bolted for the safety of the drain. As Bobbins fell backwards on to the cobbles, a pale grey streak flashed past him. It sprang on the fleeing rat. There was a shrill scream; and then the rat's lifeless body was tossed aside. The grey cat, Spindle, arched her back and smiled. "That's how you kill a rat, Bob," she said. "It, it surprised me," stammered Bobbins. "And it bit my ear!" "Pah! What's an ear? If a rat bites you, you bite it back," said Spindle. "Any more of them there?" Lean and hungry, she stalked along the gutter and peered up the drain. "Come out, come out, wherever you are!" she muttered. "Come out and talk to Spindle!" Her pale eyes gleamed with hate. For Spindle hated rats with a cold, relentless passion. The other cats in the Mill agreed that no rat that came within pouncing distance had ever escaped from her deadly claws. Bobbins looked up, flinching at the taunt. That wasn't Spindle who had called out. It was Loom: a heavy black and white tomcat lounging on the windowsill. "Scaredy-cat!" sneered Loom. "Cowardy custard, marmalade mustard! He's not a cat at all. He's a mouse in disguise. Isn't he, Spindle?" Spindle did not answer. She was crouching by the drain with her tail twitching. Loom went on, "Bob's nothing but a mouse! That's why he never kills any!" "I do too," retorted Bobbins, although he had only killed two mice in his whole time at the Mill - and they had both been so old and slow that they were probably about to drop dead in any case. As for rats, he'd always been afraid of them. He'd kept well away from rats until today. "Old man Alfie'll get rid of you if you don't watch out!" jeered Loom. "We don't need four cats in this mill. I've heard him complaining about you. He'll have you drowned!" "No, he won't," protested Bob. "Oh yes, he will! He only took you because of that grand-daughter of his - that stupid Flossie with the orange hair. What an idiotic colour, for a human or a cat. She's a marmalade mustard, just like you!" "Don't you call Flossie names!" fired back Bob. He sprang up to the windowsill to try and push Loom off. But Loom was much bigger and heavier than Bob, and had no intention of being pushed off. He gave Bob a cuff with his fat paw. Bob felt himself tumbling back to the ground. He only just managed to twist round in time to land on his feet. "Wimp," hissed Loom. He was about to leap after Bobbins when a sound made him stop dead. Something was rumbling. It was as deep as thunder, but it came from underground. The rumble gathered speed and volume until it almost deafened Bob. He could feel vibrations running through the cobbles, up his legs and along his whole body, making him judder. And with the rumble came the sound of a rushing torrent: of leaping, foaming water. Bob shuddered. He'd lived in the mill for three months now, and he would never get used to that sound. Whenever he heard it, he wished he was back at Flossie's house. But Flossie's mother had been allergic to cats: Bobbins made her sneeze. That was why Flossie had to give him away - and he had ended up in the mill with this rumbling monster. "There goes the water-wheel," said Spindle, listening. "Old man Alfie's started it up early today. A school group must have just arrived." "A school group? That means cake!" cried Loom. "Packed lunches, crisps, and sticky buns! Here I come!" He dropped from the windowsill with a heavy thud and lolloped up the stone staircase into the Mill. "That means mice," hissed Spindle hungrily. "Where crumbs go, mice follow." And like a pale shadow, she glided after Loom. "That means children," Bobbins said. "I like children. Maybe one of them will have red hair!" And he followed the other two up the staircase and into the roaring, thumping, grinding Mill. Half way up the steps, Bob stopped to look through the grating in the wall. On the other side of it, he could see the huge waterwheel slowly turning, its groans and clangs echoing in the vast brick chamber along with the splashing of the water. Three times a week this happened. The rest of the time there was only a trickle of water and the wheel stood silent. But on Wednesdays, Thursdays and Saturdays, when the mill was open to visitors, old man Alfie unlocked a sluice-gate to let the water in. The stream raced under the mill and set the great wheel turning. And then (although Bob did not understand how) the whole mill came to life, banging and clanking and grinding along with the wheel. All along its wooden floors, strange machines designed to frighten cats sprang into action. Bob left the clanking wheel and bounded up the last few steps. He crept in through the door to see the children. They were crowded round one of the fearsome machines. Gwen, Alfie's white-haired wife, sat in the middle of it, like a spider in a giant web. Her hands flashed to and fro. Bob shrank back. He was terrified of the rattle and thump of her machine. It was so loud that Gwen had to shout to be heard. "This is a power-loom," she shouted over the clanks and bangs. "This is a flying shuttle that I'm using to carry the thread from side to side. I can weave a nice, wide piece of cloth that way. See how fast the shuttle goes!" The little group of children in green jumpers all stared and nodded. Bob noted that none of them had red hair. He crept away from the clanking loom, past other twirling, whirling, rattling machines, and down to the far end of the Mill, where another bunch of children had gathered. Here, old man Alfie leaned on a rail while he addressed them. Like Gwen, he had to shout. "I worked in this mill fifty years ago," he said. "By then it used electricity. But in the old days, two hundred years ago when it was built, all its power came from the waterwheel. And half its manpower came from little children just like you!" The children gazed at him, mouths open. Not a red head among them... All the same, Bob wound in and out of their legs, purring hopefully in case they'd like to stroke him. But they couldn't hear his purrs over the machines, and in any case they were transfixed by Alfie. "How would you like that?" he asked them. "You'd start at six in the morning, and spend all day minding the spinning-mules, with forty-eight spindles to tend to. Forty-eight threads to mend when they broke - which was often - and forty-eight bobbins to see to and replace." Bob gave a meow on recognising his own name. Nobody heard him. Alfie kept on talking loudly. "You can have half an hour for a hunk o' bread at lunchtime. Then back to your work until seven in the evening! And all for tenpence a week!" Old man Alfie bent and picked up Jenny, the fourth mill cat, who was prowling under the machine. Alfie stroked her gently. She was his favourite cat: a sleek, good-natured tabby, who had no tail. "The cats are the only workers left here now," he told the children. "Cotton cloth gets made in great big factories now, mostly in other countries far away. This old mill just runs three times a week, for visitors to see. If we ran it every day, it'd shake itself to pieces. The rest of the time, it's left to the cats." One girl put her hand up. "Please, what do you have the cats here for?" "To keep down the rats and mice," said Alfie. "Now, this is a carding engine-"
"What are their names?" asked a boy. "This one's Jenny. The others are Spindle, Loom and that's Bobbins skulking round your feet. Now, this carding engine is what combs the cotton-"
"Why do most of your cats have funny names?" "They're named after things in the mill. My Jenny's short for spinning-jenny," said Alf, stroking her fondly. "Loom's named for a loom like you saw back there. Spindle's what you spin the new thread onto." Alfie laughed. He turned round, took something from a big box nearby and held it in the air. It was a long, thin tube. "Know what this is? It's a bobbin. That's what the cotton's wound onto before it's spun. You can have that one." "Ooh, can I?" The girl took it eagerly. "Have as many as you like. We've got hundreds of the things. They're worth nowt. And neither is that cat. Scared of his own shadow, he is! I've watched him run away from a mouse. That's why he's called Bobbins: because it means something useless - like that cat." Every single head turned to gaze at Bob. Not one hand reached out to stroke him. He backed away, and then fled for the staircase. Blindly he plunged down it, desperate to get away from the children's stares and Alfie's cackling laughter. Bobbins raced down the steps into the yard, heedless of any rats that might be lurking. From there he hurtled down a second stone staircase into the basement. He could hide here. This was where the cats had their beds, in a couple of old dog-baskets. Bob buried himself in the basket that he usually shared with Loom. He lay there shivering. Useless! Scaredy-cat! Scared of his own shadow! The words hurt. They hurt all the more because Bob feared they might be true. He lay with his head curled in his paws, wishing he was back at his old home - although in truth, he couldn't remember much about it apart from saucers of milk and a gentle voice amidst a frizz of orange hair. And he remembered there had been something called a washing machine, that rumbled and groaned like a tiny waterwheel and made him tremble. He'd been frightened, even then. He'd been frightened all his life. He would never stop being frightened. Suddenly Bob was angry. He sat bolt upright in his basket. "I'm not going to be frightened any more!" he announced furiously, even though there was nobody to hear him. "I'll learn to catch mice - and rats too! I'll practise until I'm better than Loom, and better than Jenny, and - and almost as good as Spindle!" His vows echoed around the gloomy basement. It had once been a storeroom, but now it was furnished as a mill-worker's cottage for visitors to look at. So it had a stone sink, a tin bath hanging on the wall, a shelf with two chipped china dogs, and a table on which stood an inedible plaster loaf. The cats' baskets were underneath the table. Just then, there was a clatter and a shout. The children were coming out of the mill and hurrying across the yard to see the basement room. Bob couldn't bear to stay and be laughed at yet again. Jumping out of his basket, he raced up the steps before the children reached them. He streaked to the other end of the yard and darted through the turnstile. Then he crept stealthily past the kiosk (where Loom sat hopefully waiting for stray crisps) and, unseen by anyone, made his way down to the stream. He pattered along its bank towards the millpond. Here it was quiet. There were no people. When the stream rushed under the mill, it turned into a surging beast: but here it made a gentle, gurgling pond. Small animals rustled in the undergrowth nearby. On the slopes above the far side of the millpond stood a white bungalow. That was where Alfie and Gwen lived. Bob had often seen them in the garden, but right now they were busy in the mill. "I can practise pouncing here," thought Bob, "and nobody will know! So I'm scared of my own shadow, am I? We'll see about that!" And to prove it was a lie, he whirled round suddenly to leap upon his shadow and pin it to the grass. "Gotcha!" He pounced on his shadow time after time, and it never got away. Bob felt very pleased with himself. "Stage one," he said, panting. "Now let's try catching something harder! But not too hard." A trail of ants provided an answer. Bob leapt and pounced again until the ants were in disarray and blundering into each other. Bob was very satisfied. "Stage two," he said. "Now let's look for a mouse." He lay low in the grass by the water, watching and listening. He kept quite still apart from the merest flick of his tail. Jenny had told him that mice were to be easily found here. But it seemed a long wait until, between a blink of his eye and its opening, a small, brown, furry shape appeared next to the pond. It looked fatter than the mice in the mill; but it was certainly not a rat. As slowly as a snail, Bob gathered his limbs beneath him. The mouse rustled in the grass, sat up and groomed its whiskers. The mouse squealed as Bob's claws fastened on its tail. It wriggled from his grasp and dived into the pond. Before he could stop himself, Bob leapt after it - straight into the water. It was so shockingly cold that he forgot to breathe. That was just as well, since the water was over his head. It rushed through his ears and gripped his body in cold fists. Frantically scrabbling with all his legs, at last Bob managed to get his head above the surface. "Miaow!" He yowled for help, but there was nobody to hear. He would have to get himself out. By paddling all four paws as hard as he could, he struggled slowly to the shore and at last heaved himself out on to the bank. He was trembling all over. He collapsed in a dripping heap. On the far side of the pond, the strange mouse emerged from the water, gave itself a quick shake and disappeared into a burrow in the bank. "It's not a mouse at all!" thought Bob. "It's one of those other creatures Jenny once told me about. A mole or a vole. A vole, I think." He remembered what Jenny had said: one liked water, one liked earth, but they were both impossible to catch. "Well, I nearly caught it," said Bob, standing up and trying to shake himself the way the vole had. "And I got myself out of the water. I swam - sort of." Spindle could probably swim like a fish, he thought ruefully; and Jenny must be able to swim, too, if she'd been chasing water-voles. Then a sudden thought hit Bobbins like a thunderbolt. "If I learn to swim, Alfie can't drown me!" And with this thought, he leapt straight in again. This time the shock wasn't quite so bad. The water didn't feel so cold. But when Bob tried to breathe it in, he floundered to the surface coughing and choking, before sinking again like a stone. His paws touched pebbles on the bottom: he tried to jump, and pushed himself back up again. Then he paddled to the bank and slumped there, gasping. "I can't do it! It's too hard. It's too wet." He lay there wearily for a few minutes. Then he sat up. He wasn't going to give up yet. Seeing the vole dive in again from the far bank, Bob watched it carefully. "If a little thing like that can swim, surely I can too! How does it do it? Eyes out, nose up, looks like it's running underwater..."
Bob stared at it for a while. "Head out, that's the thing," he said, before jumping in for the third time. This time he put his nose out before he breathed. He tried running underwater. And he could do it! He was swimming! He managed a small circle before pulling himself out onto the grass again, exhausted. Swimming was hard work - much harder than running on land. "I'll come here every day," vowed Bob, "and swim a little more, until I can get right across the pond. Then maybe I'll catch a vole! That'll show them! Jenny said they were uncatchable." He padded slowly back towards the Mill, dripping, but much happier than before. "That's two things I can do," he told himself. "I can catch my own shadow - and I can swim!" Although Bob could catch his own shadow, however, he still couldn't catch mice. He lurked for hours in dusty corners, waiting for them. He skulked behind the silent looms. He hid amongst the bales of cotton and listened to the mice squeaking and rustling in their nests within. "You need to hate them," Spindle said, her pale eyes glittering. "You have to really want that mouse dead." She sat by a little pile of mousy corpses in the middle of the weaving-room. Bob didn't hate mice. Maybe that was the problem. "They have to be afraid of you," snarled Loom, settling down beside a mousehole to wait. The mice were certainly afraid of Loom. The sight of him seemed to hypnotise them into terror until he swatted them with a heavy paw. "They're not afraid of me," sighed Bob. "How do you catch mice, Jenny?" "I just do," said Jenny. She killed mice with neat efficiency, then tended to forget them and left their bodies lying round the mill. Sometimes Bob would drag one of these small abandoned corpses over to Alfie, pretending it was his own work. "Caught one today, have you?" Alfie would say sarcastically. "Amazing. Did it have a wooden leg?" Bob was sure he knew. And these were just mice. He didn't even dare to think about a rat. All the same, he kept doggedly practising. He pounced on scraps of cotton until his legs ached. He chased rolling bobbins around the floor until his heart was thumping. Every day he went out to the pond when nobody was watching, and tried to catch the water vole. He never got close to it - but he was getting better at swimming. This meant that he was less scared of water. He no longer hated the rain. This was useful, since it rained every day for a week. When there was a thunderstorm, Bob made himself go out in it. After all, it wasn't as wet as the millpond; and the thunder was no louder than the rumbling of the water wheel. "I shouldn't be afraid of anything," Bob told himself. "I'll tackle the machines next." So on Saturday, when the mill was full of the shouts of children and the grinding roar of the water-wheel - to say nothing of the drumming of the rain - Bob crept up to the weaving room. He was determined to master his fear of the machines. He scampered over to the big loom where Gwen usually sat. She wasn't sitting here now, though; she'd just got up to show her group of visitors an old spinning wheel. Her back was turned. Bob sprang up onto her chair and glowered at the loom with its broad web of threads. He'd teach it to scare him with its bang and clatter! He wasn't afraid of it, not one bit. To prove it, he pounced upon the web and began to tear and bite and pull the threads. They resisted him, but he was stronger! This machine wouldn't get the better of him! The loom began to grind and groan. Bob's feet slipped between the tight rows of thread and caught there. He couldn't pull them out. The more he struggled, the more entwined he became, until he ended up in a massive multi-coloured tangle. Then he heard Gwen's angry voice. "Get out of there! You naughty cat, what do you think you're doing?" She hauled Bob out of the loom, scraping his legs, and dumped him on the floor. Everyone was laughing at him. Children giggled, teenagers snickered, and grandads chuckled. "Let me tell you," Gwen scolded him, "if you were a mill-hand and you made that mess, you'd be out on your ear!" At that, the crowd laughed louder. Bob scampered off, feeling most indignant. Gwen shouldn't have interfered. He'd been just about to get the better of the loom! In another minute or two, it would have been defeated. As it was, he still needed to prove he wasn't afraid of the machines. So next Bob ran past the spinning jennies to where the great spinning-mule stood. Backwards and forwards it slowly rolled on clanking iron wheels. Every time it rolled out, it drew out forty-eight long strands of cotton, spinning them to make them thin and strong. Then it rolled back in, with enormous clangs and bangs. "This is good for stalking practice," Bobbins thought, as he watched the rolling iron wheel. He began to stalk the wheel along its track, following it. When it turned and came back towards him, he planned to pounce and catch it. --when something hit him hard in the stomach, and sent him flying across the wooden floor. He sprawled there, panting, all the breath knocked out of him. When he looked up, he saw Jenny crouching over him. Her fur stood up on end. She arched her back and spat angrily. "What did you do that for?" cried Bob. "I was just about to catch it!" "Catch it? You can't catch that machine!" hissed Jenny "It'll catch you!" "How do you think I lost my tail?" Jenny looked so fierce that Bob shrank away. He stared at the huge iron wheel trundling down its track. "Haven't you listened to Alfie? Two children died long ago, sweeping underneath that mule, when the carriage caught them! If it can crush children, what chance would a cat have?" Jenny snapped at him. "Don't you dare do that again!" Bob had never seen Jenny look so furious. Abashed, he turned and ran. Bob raced down to the yard, which was full of puddles. Spindle sat there, shivering. Rain was pouring down; the water wheel boomed angrily behind its grating. And then, suddenly, out of the drains came a stream of rats. Five or six of them shot out across the yard. Immediately, Spindle pounced, leaping this way and that, twisting and turning in mid-air. Unable to decide which rat to catch, for once she failed to catch any at all. The rats all disappeared through the turnstile where Loom lay snoring. He woke up with a start, but too late to pounce on any of the rats. "Where did they come from?" he cried. "The drains must have flooded and driven them out," said Spindle, spitting with annoyance. Bedraggled and angry, she stalked down the steps to the basement and threw herself into one of the cats' baskets. Bob followed to try and cheer her up. "Don't worry. You'll get them next time!" "I would have caught them for you," said Loom, plodding down the steps and sprawling lazily in the other basket, "but I'm too stiff with the damp. Rheumatism. I can hardly move." "You're taking all the basket up!" protested Bob. "Shove over!" "I just told you," yawned Loom. "I can't move." "You never catch rats anyway," Bob told him defiantly. "You only catch mice. You run away from rats." "I do not, you little-!" Loom jumped up in annoyance. Bob promptly lay down in his place. "Thought you couldn't move," said Spindle icily. Loom flopped into the basket right on top of Bob, almost smothering him. Bob had to squeeze to the edge. "You know what?" Loom whispered, his green eyes gleaming. "Alfie's grand-daughter's come to visit him. That girl with the stupid marmalade hair." "Flossie!" Bob's heart filled with joy. He began to purr. "And you know what else?" Loom went on. "Alfie's going to tell her what a useless cat you are. He'll tell her that he's going to get rid of you." "Then he'll give me back to Flossie!" "No, he won't. You make her mother ill. That's why you're living here, dumbo. They'll just have to drown you," said Loom with satisfaction. "Alfie can't drown me," said Bob. Bob was just wondering whether to tell Loom his secret about learning to swim, when Jenny came leaping down the steps. "The mill's closing early," she said. "Everyone's going home. There's too much rain. Alfie says the stream's too high, and he's shut the water wheel down." Sure enough, the clanking wheel had gone quiet. "Time for a snooze, then," yawned Loom, shuffling in the basket so as to take even more of the space. Bob decided not to tell them about his swimming. Loom would only sneer and laugh. In any case, ten minutes later, the other three cats were fast asleep. Despite being so squashed in his basket, Bob began to drift off too. He dreamt a happy dream of water-voles and mill-ponds. He was swimming after the vole, with rain gently splashing all around him, when he woke with a sudden start. "Where am I?" he thought, dazed. "What's happened? Am I in the pond?" For he was surrounded by water. The basement floor was awash. Dirty water swirled and lapped at the cats' baskets: the body of a dead rat floated past. "Wake up!" Bob cried. "Flood! There's a flood!" Loom heaved himself up as water sloshed into his basket. He leapt across into Spindle's basket with a curse. "I'm all wet! What have you done?" He glared at Bob. "He hasn't done anything. Listen! I can hear the water-wheel going round," said Jenny. "But I thought Alfie had locked it to stop it turning." All four cats listened. Sure enough, they could hear the hollow clank and grind of the great wheel echoing through the building. They could hear the water rushing past its blades. And, worst of all, they could see the water in the basement start to rise. Now it began to seep into Spindle's basket. With a yowl, Spindle leapt out onto the nearby chair, and then sprang up to the table. The other cats followed, until all four stood there, looking down at the filthy, swirling water. "We need to get to the stairs!" said Jenny. Spindle shook her head. "We can't jump that far. We'll fall in." Huddled on the table, they watched the water continue its slow rise up the table legs. "Alfie will come and get us," Jenny said. "But what if he doesn't?" wailed Loom. "He'll have too much to worry about to think of us," said Spindle. "We'd better run for it," said Bob. "Run?" squealed Loom. "Through that? It's way too deep!" "And rising fast," muttered Spindle. She arched her back and stared down bitterly at the water as if it were a deadly enemy, worse even than the rats. "All right. We'll swim, then," said Bob, a little puzzled. "Swim? Swim?" said Loom hysterically. "Listen to him! He wants us all to drown!" "Bob, cats can't swim," said Jenny. As she spoke, the table rocked beneath their feet. The plaster loaf slid off and fell into the murky water with a splash. The four cats, clawing desperately at the table, nearly followed. Soon the table would be afloat and at the mercy of the swelling tide. "What do you mean, cats can't swim?" asked Bob. "Common knowledge," Spindle said. "Help!" She grabbed at Loom as the table lurched again. "This table's going to tip us off at any minute!" "We need a boat," said Bob. "You need a brain," sneered Loom. Bob shrugged, trotted to the table's edge and dived into the water. It was no colder than the mill pond. But it was full of strange whirling currents that sucked and pulled at him. It was not easy to swim through; he was glad to reach the shelf on the other side of the room. Climbing out, he perched on the shelf. Now he was close to the tin bath hanging on the wall. The tin bath was his target. It was already half afloat, but still attached to its hook by a piece of string. Bob leapt up onto the end of the bath and gnawed at the string above him, until it finally gave way. Both bath and cat plunged down into the water and landed with a tremendous splash. Bob found himself, not in the bath, but in the water next to it. He heard Jenny squeal in horror. Bob had no intention of drowning. He swam behind the bobbing bath, pushing it with his head. It was hard work; but slowly, slowly the bath drifted towards the table and the screeching cats. Jenny leapt and landed in the bath. It rocked but did not capsize. Spindle was next. She closed her eyes tight, took a mighty leap - and missed the tub entirely. She landed in the water, sending up a huge shower of spray. "Spindle!" wailed Jenny. Spindle came to the surface. With her eyes still screwed shut, she twisted and gasped and tried to bite the water before going under again. Bob dived. His eyes stung as he opened them underwater; but he could see the shape of Spindle thrashing around. Seizing the scruff of her neck in his teeth, as if she was a kitten, he hauled her to the surface. Since he could not lift her into the tin bath, he pushed her onto the lurching table, which was now almost afloat. "Try again!" he gasped. "Eyes open!" Spindle was shivering. But she took a deep breath, opened her eyes and leapt again. This time she made it. The bath bounced in the water as she landed squarely in it. Loom still cowered on the table. "I can't do it!" "Yes, you can!" gasped Bob. "Just jump!" Loom hesitated. Then a violent surge of water upended the table like a see-saw. With a yowl, Loom shot off it and fell into the bath on top of the other two. The three cats were safe - for the moment. But now they had to get outside. Bob pushed the tub towards the steps. It was so heavy now that he needed all his strength to shift it. Eventually it began to float towards the doorway. But Bobbins was nearly exhausted. He spluttered, sank, and thrashed his way back to the surface. He was panting for breath. He couldn't stay up any longer. He could feel the icy currents tugging and pulling at him, dragging him down, down, down. The cold water clutched at him, and he began to sink. Then he felt sharp teeth fasten in the back of his neck. Just as he had hauled Spindle up, now he was hauled up himself - out of the water, over the edge of the tin bath and thud into its base. Spindle let go of him. Jenny let go of Spindle. Loom let go of Jenny. They had formed a chain of cats to reach him. "Thanks," Bob murmured faintly, before a fit of coughing overwhelmed him. He lay there helplessly and looked up at the ceiling. It was spinning. The bathtub was going round in a circle. He felt it scrape against the wall, nudging up the stairs on the surging tide. It reached the doorway. For a moment it stuck, wedged there- but the current was too strong for it. With a last scrape and a bang, the bath tub full of cats shot out into the yard. The cats sat up in their tin boat and stared. For the yard was now a lake: a dark, oily-looking, seething lake, adrift with empty crisp packets and plastic cups, dead leaves and dead rats. And they could still hear the thunder of the water wheel, its sound uneven now. It was at the mercy of the newly raging river. Bob shivered. "Where has all this water come from?" he wondered. "The sluice gate must have burst," said Spindle hoarsely. She sounded scared. "It's happened before. I heard Alfie talk about it. The whole river flowed into the mill." "The Great Flood," whispered Jenny. "Where's Alfie? Do you think he's safe?" "Who cares? We're all right," said Loom. "I wouldn't be so sure," groaned Spindle. The bath spun round again as the flood carried it across the yard. The turnstile had broken: there was a gap where it once used to be. And the torrent of dirty water was surging through it. The cats cowered in the bottom of the bath as it was buffeted through the gap and tossed past the tattered awnings of the kiosk. It skittered out on the swirling flood, spinning like a top. Dizzy and distressed, the cats yowled in fear. At last the wild spinning and rocking of the bath began to slow. Bob recovered enough to peer over its rim. "That's the mill pond! But it's huge! Where have its banks gone?" For the mill pond had swollen to the size of a small lake. The water lapped right up to the fence of the white bungalow. "I feel sick," moaned Loom. "Can't you stop us going round and round? This is all your fault, Bobbins!" A grey paw shot out and knocked Loom over. Spindle hissed at him ferociously. "Be quiet, you big useless lump! It was Bob who saved us. What did you do except yowl in fright? And I wasn't much better. It's thanks to Bob that we're not at the bottom of that." She flicked her tail at the pond. Loom lay in the tin bath staring at her with his mouth open. "Well?" said Spindle, standing over him. "Say thank you, Bob!" "Thank you, Bob," Loom mumbled. "That's all right," said Bob. He was gazing out to see where they might land. The bath tub was still revolving slowly, so that the world swept past him. "However did you learn to swim?" asked Jenny. "I taught myself. I copied a vole I saw swimming over there." He pointed at the far side of the pond. And then he saw them. Three figures: humans, standing by the fence, just above the waterline, waving at them. Gwen and Alfie, and a smaller figure, with a fuzz of orange hair, who was jumping up and down. The bath spun round again, but now it was drifting closer. A few moments later, it was close enough to shore for Alfie to wade out and catch it. "Well, bless my soul! Four cats in a tin tub! Who would have believed it? I thought you must all have drowned - and I couldn't get into the basement to find out!" Alfie began to pull the tub towards the shore. "The cats are safe!" he called. "Thank heavens," said Gwen. "However did they manage it?" "Goodness knows. Get some blankets! They're cold and wet." "Are they all there? All four?" cried the smallest person anxiously. Alfie did not answer. He was breathless with tugging the tin bath back to land. But Bob could not wait. ...towards the hands that reached out for him, scooped him up and cuddled him, all dripping as he was. A frizz of orange hair bent over him as Flossie kissed him on the nose. "Oh, Bob, you clever cat!" she said. "You really are the bravest, cleverest cat of all!" Click here for Kindle (mobi format). Click here for Nook, Kobo and other ereaders (epub format).